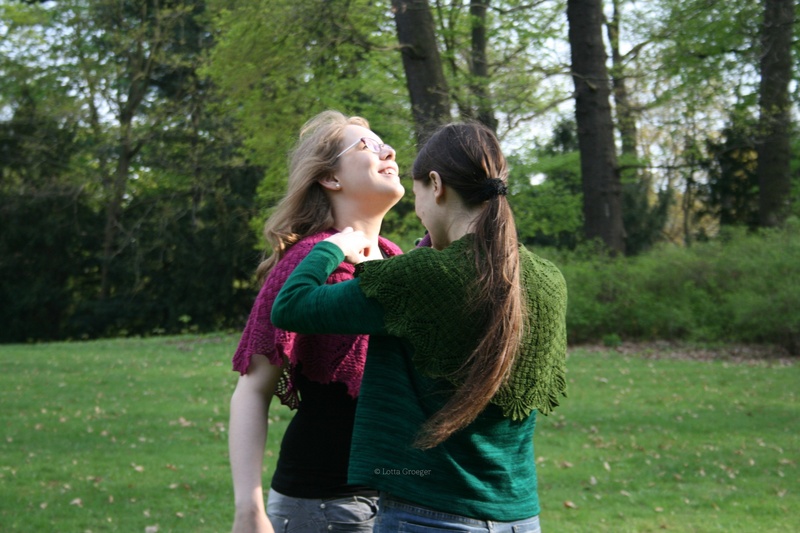 A little behind-the-scenes for my latest shawl design, Peri’s Paradox, newly published in knitty. 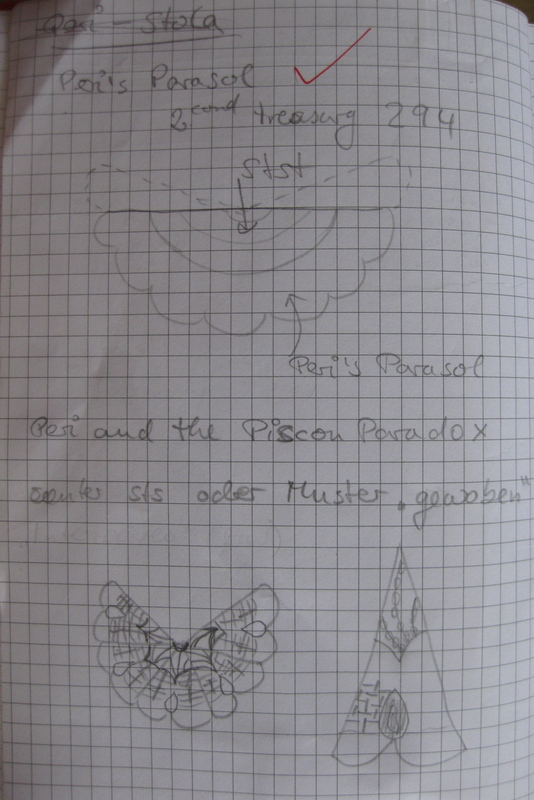 The whole thing started out as a little sketch in my notebook. First it was just a half circle with stockinette stitch and a border, but with time and playing with the idea in my head I changed the stockinette stitch to the woven-pattern and later added the reverse stockinette panel on top. The whole pattern is an homage to one of my favourite Doctor Who companions: Perpugilliam “Peri” Brown and the audioplay Peri and the Piscon Paradox. The first version was worked as part of the Nerd Wars over at ravelry, I’m usually in team “Shady Cels” all things comic/animation/manga/anime. 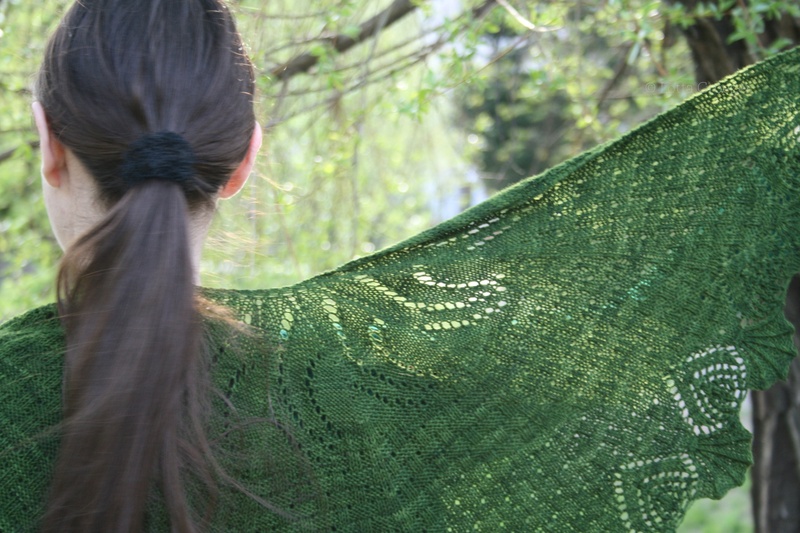 This dissertation was worked in Wollmeise 100%/Pure in Spinaci and I used 88% of the skein, so if you have a skein of Wollmeise Pure lying around this is a nice project that uses just that one skein. This is the version I send to knitty. From knitty I got a lovely silk/merino yarn, SweetGeorgia Yarns Silk Crush to be precise. A strangely aped name for the yarn. It’s lovely and smooth and cuddly like you would expected from a silk/merino blend but the silk characteristics are very strong and you get that paper-ish feeling from pure silk with the warmth of merino. 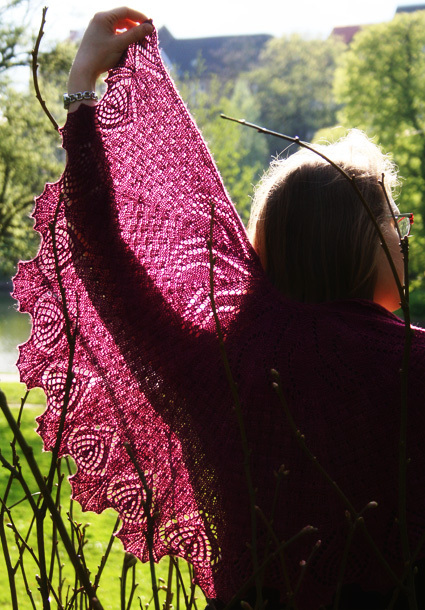 The colour chosen by knitty was a nice deep pink-ish/purpel-ish-berry colour “Raspberry”. Which is a colour you would not find in my stash but the best thing about knitting-friends with different tastes in colour is not only that you don’t have to fight over the same unique skein of yarn but also you can “pay” your model with the piece she’s modeling. Mostly pinning things down as it was a bit windy. I hope you will all have fun with my pattern, it’s not the easiest I ever designed but it’s one of my favourites and get’s a lot of wear. Posted in Designs and tagged design, Doctor Who, green, knitting, knitty, lace, Wollmeise. Bookmark the permalink.